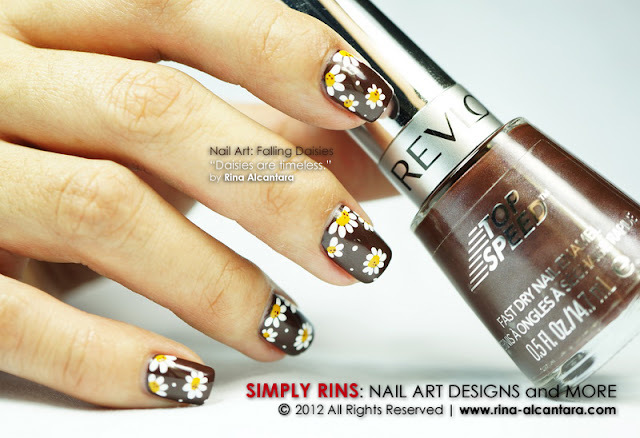 After trying a few polishes from the Revlon Top Speed Fast Dry Nail Enamel collection, I instantly fell in love with Espresso. So I decided to wear it the following day and after, decided to paint daisies that I think was perfect for this color. My idea was to create a falling effect. 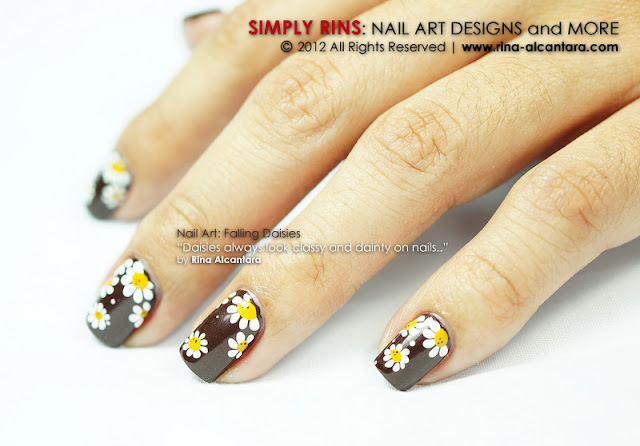 I painted the daisies near the cuticle area to achieve that. 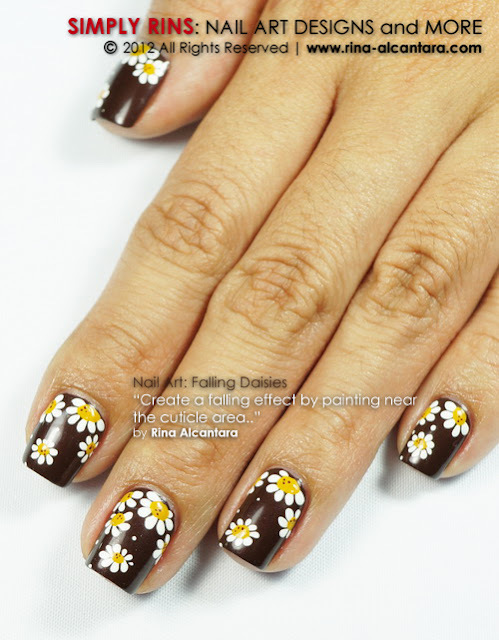 The daisies on top were painted partially to appear as if they're peeping out and 1 daisy was painted near the nail tip. I used 2 coats of Revlon Top Speed Espresso. As per review, application was easy and since it dried quite fast, I didn't need to wait that long to paint the design. I used acrylic paints and a detailing nail art brush to paint the daisies. By now you might have noticed my preference to daisies when it comes to floral designs. I really find this type of flower really classy and dainty. They popped out really well over this dark chocolate base color. If you like a more subtle design with these flowers, you might want to consider a more lighter background. If you're looking for a simple design that is easy and quick to do, I would suggest this. I haven't been able to spend that much time on my nails because of work and a persistent bad cold. This design was perfect to do given the situation. 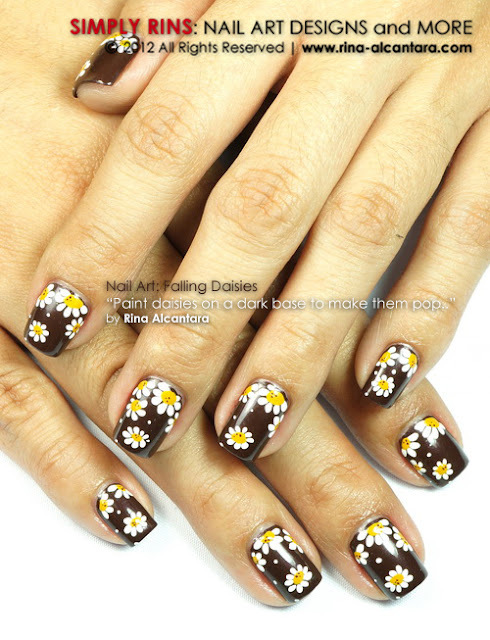 What do you think of daisies on nails? This is an adorable manicure Rins, you are so talented! :O i was just gushing over your review and swatches of espresso yesterday, and now you've got this amazing nail art to tempt me further! haven't had the time to drop by a drugstore yet, but i'm definitely dying to get this colour now! get well soon! drink some chicken soup - it always helps me recover from a cold faster! Oh wow. This is so beautiful. I love it. I'm feeling better. Thank you for suggesting the chicken soup. I really looooove your daisies ! Beautiful as always! The deep background color really sets off the daisies nicely. Gorgeous design. The base color is lovely. Spectacular design. I love the base color.